Italian Cities You Must Visit If You Love Food! Italian Cities – Foodies going on weekend breaks to Italy will certainly find that the European country offers something that tickles their taste buds. Italy’s rich culinary history means that wherever you go, you can be confident of sampling some fantastic food, whether it’s in a high-end restaurant or from a bustling market stall. Pizza is perhaps Italy’s most famous culinary export, so make sure you visit Naples, the city where the dish was first created. While it was initially sold by street vendors to the working classes, pizza’s status and popularity quickly spread when baker Raffaele Esposito created one for the Italian royal family which was very well received. If you’re in the mood for pizza, you’ll certainly be in the right place to indulge in the famous dish by going on holiday to Naples. You can find pizzerias throughout the city – not to mention the rest of Italy – but you may want to visit the family-run Antica Pizzeria Port’Alba, thought to be one of the oldest eateries of its kind in the country. Alternatively, you may wish to visit Da Michele. Operating since the 19th century, this traditional restaurant only serves two kinds of pizza (Margherita and Marinara) although both are extremely tasty. But there is much more to Italian cuisine than just pizzas, something that you will certainly find to be the case if you visit Tuscany. Extra-virgin olive oil, bread and grilled meats are staples of Tuscan cuisine, so a trip to Florence – the region’s capital – could be a great place to sample specialties such as calamari in zimino (stewed squid) or Florentine chicken, which is a concoction of chicken breast, breadcrumbs, Parmesan cheese, celery, spinach, onion, paprika, cream cheese and garlic powder. Vegetable and bread soup – is also one of Florence’s most popular dishes, so be sure to ask for this when visiting one of the city’s many restaurants. Milan should also feature in the list of places that foodies on Italy holidays should visit. Cuisine in the northern city and the rest of the Lombardy region is heavily centred around cheese, with gorgonzola and mascarpone among the varieties produced locally. Visiting Milan will also give you the chance to sample a range of other dishes including risotto, cassoeula – a type of meat and vegetable stew – and panettone, a traditional cake. This is the perfect accompaniment to a cup of coffee, so following an afternoon of sightseeing why not head to a cafe to grab a slice and an espresso? Some of the world’s leading chefs – including Michelin-starred Gualtiero Marchesi – were born in the city, so you can be sure of being able to try some of the best cuisine Italy has to offer when you visit Milan. Foodies should also stop by Venice. Not only is the city famous for its network of canals but it is also a great place to sample what cuisine the Veneto region has to offer. Venice’s location near the Adriatic Sea means that most of its dishes are heavily influence by seafood. Baccala mantecato is one such specialty, which consists of codfish cooked in garlic, parsley and olive oil before being creamed in a blender and served with polenta. And if you’re keen to sample some Italian wine you could hardly be in a better place to visit than Venice. Chardonnay, Merlot, Pinot Bianco and Pinot Grigio are among the varieties of grape that are produced in the Veneto region. For a classic Italian foodie holiday, make sure you visit Rome. The capital is home to a wide range of eateries, so there is bound to be something that suits your budget and tastes. Pasta is a particularly popular dish here – you can even visit a museum dedicated to it – so why not follow the example of the locals and order a bowl of spaghetti during your stay? Bruschetta and spaghetti alla carbonara are among the other culinary specialties that you can try here. Italy really is a foodies’ paradise, so you can be sure of sampling great cuisine wherever you go! 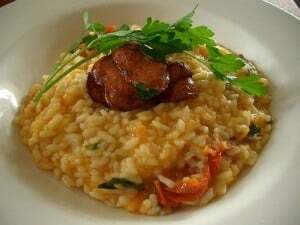 What are some of your personal favorite Italian dishes? Italy’s delicious food culture inspired me to start experimenting and learn more about cooking, and during my time there I learned a thing or two about food. The Color Of The Pistachio – Be Aware! A great way to quickly check if the gelato is of good quality is to look at the color of the Pistachio flavor. If it’s neon green or very bright in color, it’s a sign that the ice cream is manufactured and filled with artificial coloring and flavoring. Good home made Pistachio gelato should have an earthy green color – in general, good gelato of any flavor should have soft, muted colors. Make Sure The Gelato Is Hidden! Although ice cream looks so much better when it’s arranged in a big mound with fruity decorations, it’s not a good sign if you want high quality ice cream. High quality Gelaterias keep their Gelato in covered metal canisters, because that way they can preserve it better and keep the ice cream at the ideal temperature, giving it that perfect creamy, dense consistency. The big piles of sculpted gelato behind glass counters have often been infused with air. In some cases, so much air is injected into the gelato during production, that half of it by volume is composed of air. The whole concept of Gelato is that there is as little air in it as possible, which makes it dense and yummy – so next time don’t be fooled by the large mounds or the fruit on top, it might not even be used in the making! Look at that blue smurf-colored gelato, that’s a bad sign of artificial flavoring and coloring. Fruity decorations look better than they taste. 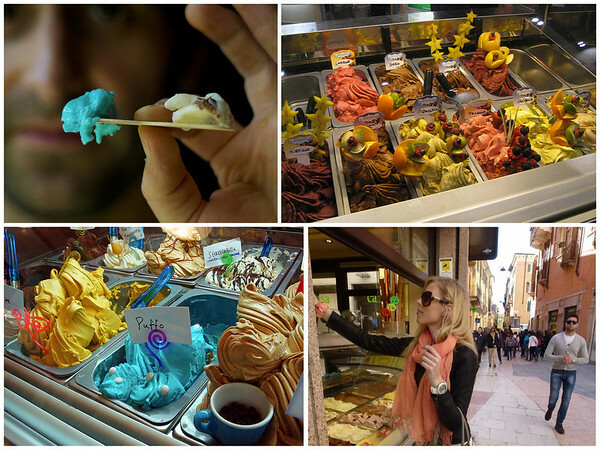 Sculpted gelato is a sign of air infusion. Try to find Gelaterias that make home made Gelato (preferably in the back room of the shop) and advertise their gelato as ‘produzione propria’. Another tip is to avoid shops with bright neon signs outside, as often they’re a giveaway for poor quality – the best Gelaterias usually don’t use them. Gelato was one of the main things I longed to indulge in when traveling to Italy, but what is it about Gelato that makes it so much better than any other ice cream? 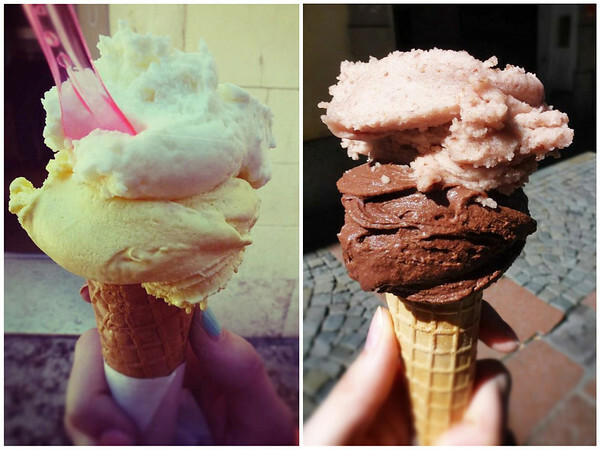 The main ingredient that differentiate Ice cream and Italian Gelato is milk. Ice cream is made with cream and has air whipped into it. Gelato is made of milk and has no air added at all (except the small amount of air that is naturally produced in the churning process), which is why it’s so dense. Good news for your Italy trip is that Gelato also has less fat and calories than ice cream – so no need to feel bad about eating too much of it! If you don’t have the time to find the absolute best local gelateria making home made ice cream, then GROM is a trustworthy brand that has shops all over the country. Thanks for adding your tips for other good places to sample Italian food! We all have different opinions, especially when it comes to food – thanks for sharing yours. I too love traveling to countries where they have amazing food. We haven’t been to Sicily yet, would love to go there! Hi Sofia, I loved your description of thessaloniki (I grew up in salonika and miss its food). I also read your Italy guide and was wondering where did you eat the tuscan chicken when in Florence?